We had 35 dedicated volunteers who helped us collect 445 species observations in 6 different hike locations. Stay tuned for our report coming out soon! A special thanks to our photographers who got some AMAZING shots of the day. 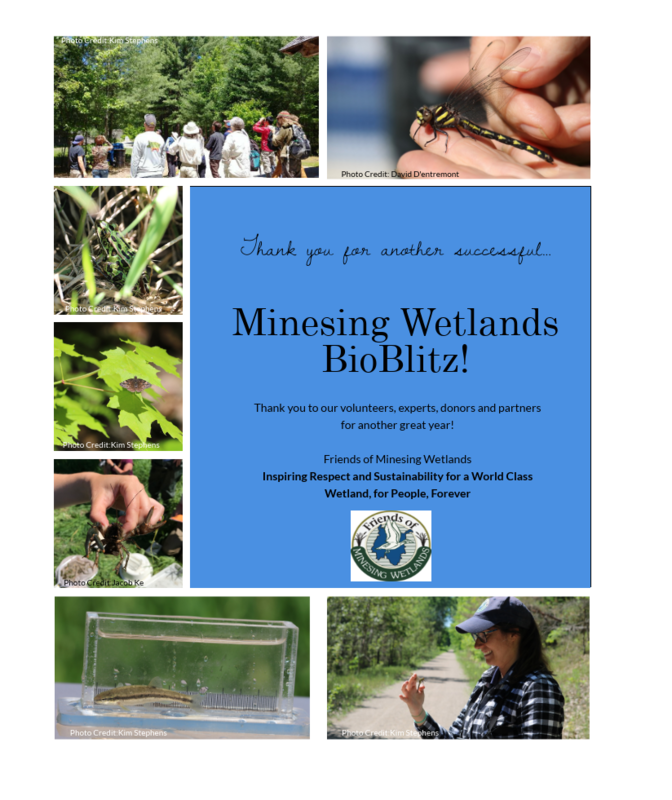 Categories: bioblitz, Education and Outreach, Event, Stewardship, Volunteer opportunity | Tags: bioblitz, Citizen Science, Minesing Wetlands, stewardship | Permalink. The Friends of Minesing Wetlands are excited to announce the first Bioblitz of the Minesing Wetlands on June 3, 2017. A Bioblitz is a volunteer-based biological inventory of a specific area. Participants include local scientists, professional naturalists, amateur enthusiasts and members of the general public. The goal of the Bioblitz is to identify as many species as possible in a set amount of time. This event provides community members with hand-on learning opportunities that can enhance their knowledge of species identification, biodiversity, citizen science and stewardship. You will be conducting surveys on a series of hiking trails located in the peripherals of the Minesing Wetlands. You will meet your expert leader and/or participants at your designated hiking trail (which you will choose after you register). All participants will be required to stay with their expert leaders, within close proximity to the designated trail at all times. After the morning and before the afternoon sessions happen, everyone will reconvene at Basecamp (Edenvale CA) to enjoy lunch and brief words of thanks from the organizers. Expert Leaders and Participants will be able to sign up for a morning or afternoon hike post-registration, there is no expectation that you commit to a full day, but to simplify the ticket process we have made it an all day event. There will be a kid-friendly hike available. Parents will be required to stay with their children at all times during the event. We are currently searching for expert leaders to lead or co-lead one of 7 hikes. Please see “Expert Leader” ticket type for more information. We are also seeking behind the scenes help to set up, tear down, prepare food, etc. Please see “Behind the Scenes” ticket type for more information. We will now be accepting participants! Please see the “Participants” ticket type for more information. Categories: Education and Outreach, Event, Friends, Science, Special Project, Volunteer opportunity, Wetland Ecology | Tags: Bio Blitz, biological inventory, Citizen Science, inventory, Minesing Wetlands, species | Permalink. Local reptiles and amphibians take centre stage at “Evening of Information” presentation. Utopia, Ontario, Thursday November 10th 2016 – Wonder what’s creeping around in the Minesing Wetlands? The Friends of Minesing Wetlands present an educational program about the reptiles and amphibians found in Simcoe County. Special guest speaker Jeff Hathaway from Scales Nature Park will discuss identifying, handling and the threats faced by snakes, frogs, turtles, salamanders and other reptiles and amphibians. As Jeff will be bringing local species, following the presentation will be an opportunity for hands-on interaction with the animals. This event takes place at the Tiffin Conservation Centre for Conservation in Utopia, Thursday November 10, 2016. It is part of the Friends of Minesing Wetlands ongoing “Evening of Science” series. Doors open at 6:30 p.m. and the presentation begin at 7:00 p.m. While this is a free event, donations may be made at the door. Registration: Limited seating available – first come, first served! All Friends of Minesing Wetlands ‘Members’ who join us for this event are entered into a free draw to win a beautiful framed photo of the Highway 60 Corridor in Algonquin Park by David Walsh. The winner must be present to win the draw. Categories: Education and Outreach, Event, Science, Wetland Ecology | Tags: amphibians, ecology, Minesing Wetlands, reptiles, scales nature park, science | Permalink. The 2016 FOWM Board of Directors are happy to present our first strategic plan! Categories: Education and Outreach, Friends, Special Project, Wetland Ecology | Tags: FOMW, Minesing Wetlands, Strategic Plan | Permalink. Join us Saturday November 19, 2016 at the Stroud Curling Club in Innisfil from 6:30 – 11:30pm for our annual Curling FunSpeil! Sign up a team of 4 or as an individual and we’ll find you a team. $25 per person. Along with curling fun the FOMW directors host a potluck dinner for all players. Cash Bar. During dinner we present on the some of the activities we have worked on to help the Minesing Wetlands and learn about this very important ecological area. Categories: AGM, Education and Outreach, Event, Membership, Uncategorized | Tags: AGM, bonspeil, curling, funspeil, Minesing Wetlands, potluck, volunteer | Permalink. Hello Friends of Minesing Wetlands! We are happy to announce our 2016 winter trips into the Minesing Wetlands. Each trip is $10pp for members, $15pp for non-members and $5pp for students. Space is limited so RSVP early. Categories: Education and Outreach, Friends, Tour, Trip, Wetland Ecology | Tags: cross-country ski, snowshoe, wetland ecology, winter, winter fun | Permalink.